Advanced formulation delivering 150mg caffeine. Tropical flavored caffeinated shots with 150mg caffeine to provide a mental and physical boost and added Vitamin B to support a reduction in tiredness and fatigue. Developed by working closely with top-level athletes and teams, the Caffeine Shot meets the needs of cyclists, runners, triathletes and players of team sports, such as football. Formulated by Science in Spoirt scientists, the Caffeine Shot's comprehensive formulation uses only the best ingredients. It's ultra-convenient format makes it easy to take before going to the gym, at races, or during half time. The Caffeine Shot is the ideal choice for professional and recreational athletes alike, especially when added focus is needed for training or competition. Like all SiS products, the Caffeine Shot is backed by industry leading quality control processes, so you know it contains exactly what's stated on the label. Most importantly we guarantee every batch of SiSCaffeine Shots is drug screened as part of the Informed Sport program, ensuring they are safe for athletes. 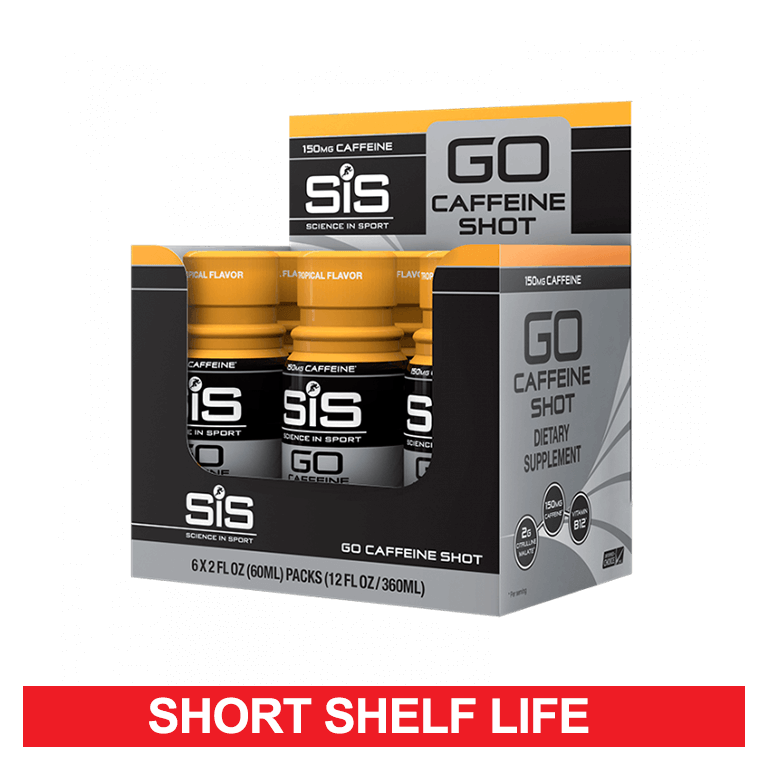 The advanced Caffeine Shot provides just the right amount of caffeine - enough to improve endurance and alertness, but without giving you the unpleasant, jittery sensation that some products do. The 150mg caffeine is sufficient to improve specific aspects of mental and physical performance while Citrulline Malate is increasingly requested by top-level athletes. Science in Sport's advanced Caffeine shot will help you get the most from every training session and perform at your best in competition. It can take 30-60 minutes after consumption for caffeine levels to peak in the blood, so if you are doing a short duration event (less than 60 minutes) you should take it before you start. GO Caffeine shot is ideal to help you prepare for a workout or tough match. If you are doing a much longer event, such as a marathon, 100 mile sportive, or half-ironman triathlon or longer, use GO Caffeine shot in the last two hours when your fatigue level is likely to catch up with you. Consume 1 shot 30 minutes before exercise for high intensity, short duration events to ensure the body starts with elevated caffeine levels. In longer duration events consume no more than 2 shots per day. Ensure you keep hydrated. This product is not intended for children, under 16's or pregnant women. Where hydration is important, GO Caffeine Shot can also be consumed with GO Hydro or GO Electrolyte to ensure a combination of energy, caffeine and fluid delivery during exercise. GO Caffeine Shot is used by the world's best athletes including Team Sky. Every batch of GO Caffeine Shot is tested and approved by the Informed Sport programme. For more information on Informed Sport & our unique world class approach, click here.